I am sitting near the window in my dining room. The kettle is rattling on the stove. So far, I’ve scarcely glanced out the window, except to acknowledge that I am sitting near enough to it to see out. But it occurs to me that it’s the window over the kitchen sink where I should write this, and the kettle is now nearly at the boil, so I will be going there — now. I choose a tea made for relaxation and stand at the window looking out over the sink. My timing is poor — the subjects I’d intended to observe are coming inside. Why? Because they are done — the older child beat the younger one at a game of soccer, played with a mini ball and nets. The older one tells me the score but I do not remember it long enough to write it down. I see now that the yard is growing dark and it will be difficult to observe much of anything. A neighbour’s porch light glows bright yellow from beyond the back fence — far away, but the brightest thing there this is. Green leaves still hang on the branches of the big maple, moving fitfully in the breeze. The leaves on the black walnut are of a lighter green, almost yellow, pointier, and hang like drips, trembling. The sky has gone the colour of bath water, clouds pale like veins or striations of veins. I have the sensation of already having written all of this, of having stood here writing these words, already, before, as if there were nothing new in them. And yet. And yet the very sureness of their existence is the surprise — that they are known or flow from me as if already known. I hear the youngest begin to sing in the shower; the bathroom’s just off the kitchen. He is singing his own version of the Spanish words to Despacito. I see plane lights blink red and white across the darkening sky. 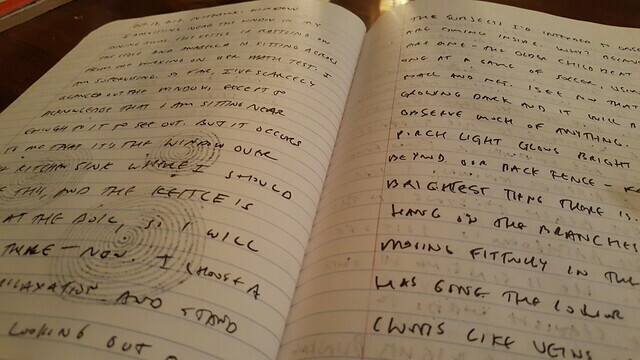 By the time I write down the words that prove they exist, they are gone. I glance back up to confirm it — gone. The leaves now look like hair overhanging swampland. I see in the window my own face, reflected against the blackening surface. This is not what I came here to see. Tired and ghostly. The youngest emerges in a towel, leaving sopping wet footprints across the tiles. All the writers I read about, the ones I long to emulate, write in longhand on lined yellow notepads. Well, I think, this will have to do. I am writing this in block letters into a notebook, standing up, staring out of a dark window at my own face whose reflection can’t escape being sectioned by the shining porch light, while the youngest, now in pajamas, returns to guzzle water. He stands far too near to me. The sound of the water being gulped and gasped down his wide open throat — “Dogs can’t drink water like people, Mom!” — disgusts me irrationally. He belches. His chest is bare. He is gone. I’ve now written long past the clock. Will my students do the same? Will they get lost in their own windows?